The following speech was delivered at the Global Peace Leadership Conference in Kampala, Uganda under the theme, “Moral and Innovative Leadership: New Models for Peace and Development,” on August 1-2, 2018. It is my honor to address this Global Peace Leadership Conference on the timely theme of “Moral and Innovative Leadership: New Models for Sustainable Peace and Development.” I want to sincerely thank His Excellency President Museveni for his leadership in hosting this convening, and guiding the important initiatives that will follow from it. We greatly appreciate the National Organizing Committee with the Government of Uganda, along with co-conveners who worked tirelessly with Global Peace Foundation to make this all possible. Please recognize the Interreligious Council of Uganda and East Africa, the Intergovernmental Authority on Development, the Private Sector Foundation Uganda, and other partners. Special thanks are also due to former President Amani Karume of Zanzibar, Chairman of the GPF Africa Leadership Mission, for his wise guidance. Finally, I want to especially thank the Minister of Public Service, Hon. Muruli Mukasa, who chaired the National Organizing Committee, the Deputy Speaker of Parliament Jacob Oulanyah, and our dedicated GPF Uganda Chapter leader, Milton Kambula. Africa is a continent vibrant with possibilities. There is vast potential in your great resources, a noble, spiritual and cultural heritage, and a large youth population yearning for a future of peace and prosperity. How can their hopes, and the enormous promise of this continent, be fulfilled? Many serious obstacles must be overcome to create truly just, equitable and flourishing societies. If these obstacles are not addressed in a comprehensive way, we are all too well aware that many of those young people, their hopes frustrated, could swell the ranks of the violent extremists and the criminal gangs that are undermining stability and prosperity in so many African countries. You are all too familiar with this here in Uganda and throughout East Africa, where religious and ethnic conflicts and extremism spread across borders and threaten peace throughout the region. To unlock the potential of the African continent, its people, its families and its youth, and to address the challenges that at times appear insurmountable, calls for a comprehensive vision and broad, long-term strategy. The core mission of the Global Peace Foundation is to advance such a vision and to engage multi-sectoral alliances in developing the strategies and practical grassroots applications that give it substance. We can see this purpose reflected in the great diversity of backgrounds represented in the participants here. You represent government and politics, business and education, and faith and community leaders. 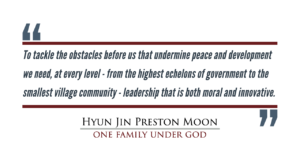 To tackle the obstacles before us that undermine peace and development we need, at every level – from the highest echelons of government to the smallest village community – leadership that is both moral and innovative. 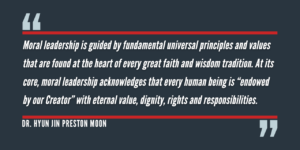 Moral leadership is guided by fundamental universal principles and values that are found at the heart of every great faith and wisdom tradition. At its core, moral leadership acknowledges that every human being is “endowed by our Creator” with eternal value, dignity, rights and responsibilities. This principle is the foundation of good governance, which is key to establishing peace and prosperity. A moral leader lives for the benefit of his people, all his people – not just one class, one faith, or one interest group. This may seem quite idealistic but it is practical politics as well. The more people in a nation are educated and empowered to be creative, responsible, and productive citizen owners, the more prosperous that nation will become. The moral leader aspires to unleash the potential of all citizens to the greater benefit of the whole. Within a moral framework of principles and values, the leader can then address practical problems in creative and innovative ways. All over the world societies are facing unprecedented challenges, and the East Africa region is no exception. Old ways of thinking are no longer adequate. Our time requires fresh, creative ideas, and thinking outside of the box. New technologies and in-depth analytics on many issues can be tapped to reveal new possibilities in this effort. Multi-nationals in the digital information field can increase their level of partnership with countries in the emerging world in this area. It is in the interest of cultivating moral, innovative leaders to take on these challenges that the Global Peace Foundation has worked with educators and officials across East Africa to establish the Character and Creativity Initiative in schools and launch Entrepreneurship Leap Hubs in Kenya, Uganda and other parts of the region. In educating youth in both character and creativity, we can equip them with a moral and innovative mindset, better preparing them to be good citizens and good neighbors. The goal is also to better prepare young people for life after school in the present environment. Recognizing that not enough traditional jobs may be created for all the booming youth population, character and creativity programs develop initiative and flexibility of thought with an emphasis on personal responsibility and the creation of new opportunities. Offering the young hope and opportunities in a time of uncertain future is also one of the keys for addressing the pressing problem of identity-based conflict, driven by the violent extremism of religious and ethnic hatred. On this issue more than nearly any other, we need more than policies and programs. We need an overarching vision, a vision based on our common humanity, a vision that inspires meaning and purpose that can transcend the divisive ideologies of the extremists. Such a vision emerges from the principle that we human beings are all created by God and endowed with equal value and dignity. 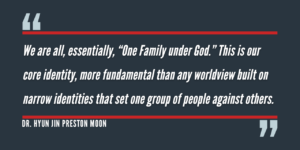 We are all, essentially, “One Family under God.” This is our core identity, more fundamental than any worldview built on narrow identities that set one group of people against others. This vision is being translated into practice and applied at the grassroots level by GPF with our many African partners even as we speak. In the wake of Kenya’s 2007-2008 post-election violence, GPF was at the forefront of conflict resolution efforts at both the government and local levels. At the 2010 Global Peace Convention, held in Nairobi, President Kibaki and Prime Minister Raila Odinga participated together in a tangible demonstration that even bitter rivals can resolve differences for the greater good of the nation. Meanwhile in hot spots like the Rift Valley town of Eldoret, GPF gave support to community groups formed to prevent future violence. In Nigeria’s Kaduna State which stands between the predominantly Muslim and predominantly Christian areas of the country, our GPF team there developed the One Family under God Peacebuilding Campaign that engages local faith and community leaders, working together to immunize their villages against sectarian violence. Two of the most active leaders of that program are here with us today. Let’s recognize Rev. John Hayab and Sheikh Maraya for their noble efforts. GPF is also highly committed to its ongoing collaboration with Interreligious Councils in East Africa, here in Uganda as well as in Tanzania, Kenya and throughout the region. By marshalling the power of faith communities in collaborative action to solve problems and counter the appeal of extremist groups like Al Shabbab, these Interreligious Councils can provide essential leadership throughout the region that also provides a model of global significance. All these initiatives are being driven by Africans themselves. They are examples of African people stepping forward to solve local and regional problems. President Museveni has called for an African-led Renaissance, for Africans to take up responsibility for Africa’s future. I fully support this approach. Through it you can expect to see the emergence of more and more effective moral and innovative leaders in every sector and at every level of society, from the village to the Government House. For my home country of Korea, I have articulated a vision, the Korean Dream, and a movement to re-unify the divided Korean people. It is a Korean-led movement where Koreans take up responsibility for their own destiny. Based on my own experience, I know that positive change for Africa must be driven by African leadership. 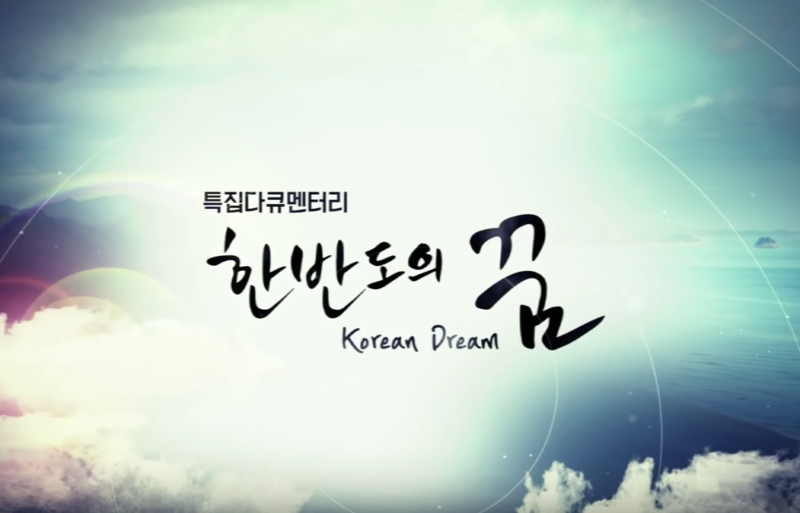 The Korean Dream is not primarily about politics or process. It draws on the deep values that underlie Korea’s culture and have guided its history. To build a new future free of division and conflict, we must learn from our past. 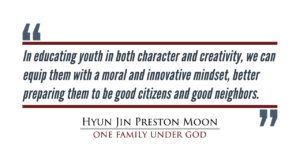 At the heart of these values is the Korean ideal of Hongik Ingan or living for the greater benefit of all mankind. It is a fitting motto for moral leadership and good governance. 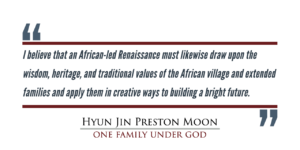 I believe that an African-led Renaissance must likewise draw upon the wisdom, heritage, and traditional values of the African village and extended families and apply them in creative ways to building a bright future. 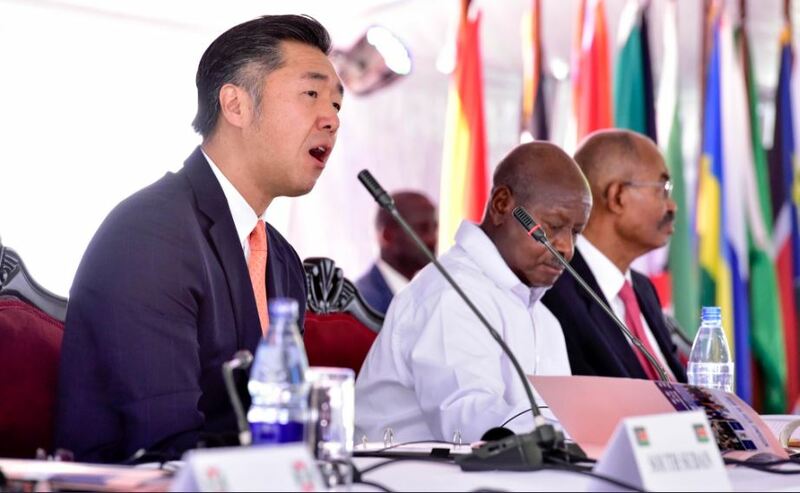 In fact, I see many parallels between Korea and Uganda, as well as other African countries. We both experienced colonial rule in the 20th century and even after independence were caught up in the geopolitics of the Cold War, squeezed by great powers and their ideologies. Korea, after the Korean war was at a similar level of economic development as many African countries today. It has shown a way forward that offers important lessons for the countries of the emerging world as a nation that was both poor and a colony not so long ago. This is important in a world in which the economic leadership of Western nations can no longer be taken for granted. Furthermore, the dominant values of the secular West often present a direct challenge to the traditional, time-tested values of Africa and Korea, particularly in fomenting forms of irresponsible individualism at the expense of the family and community. Families are the foundations of a stable and prosperous society. They shape the character and outlook of future generations of citizens. It is hard to imagine a successful future for any society in which individual whims are allowed to dominate. Resisting this tide by drawing on our traditions is another significant area where Africa and Korea can cooperate. March 1 next year is the centenary of the Korean Independence movement against Japanese colonial rule. It was launched in 1919 with peaceful mass demonstrations where the Korean Declaration of Independence was proclaimed. The centenary will be a moment for rededication to the ideals and aspirations of those independence champions, and to galvanize all Korean people in common cause toward a shared future that realizes the historic aspiration for a unified Korea that benefits all its citizens and indeed the entire world. 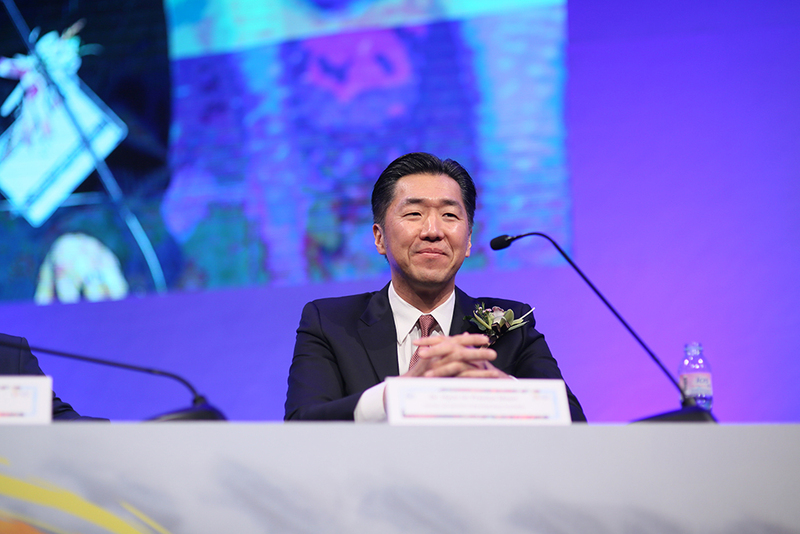 The Global Peace Convention will be held in Seoul next March focused on achieving the original goals of the Independence movement and promoting the One Korea Global campaign. I invite you all to join us in Seoul next year and to support this global campaign. With all we share in common, I believe such mutual support will provide inspiration for an African-led movement of renewal. And so, this is true in our own time, in our own nations and in our global community – we need a new paradigm and a new, normative framework for peace and development to bring with it peace and development opportunities for our families, communities, nation and world. I believe that now is the time for the framework of One Family Under God, and that Uganda and other African nations can be the leaders that demonstrate the efficacy of such a vision and approach. It is my hope that our discussions during this Global Peace Leadership Conference have been stimulating good ideas, and will forge new partnerships, that yield coordinated plans of action for ongoing positive impact. Our time together will conclude with the signing of the Kampala Peace Declaration that will lay out proposals for action to implement the action agenda agreed to here. The responsibility then lies with each of you to make it happen. 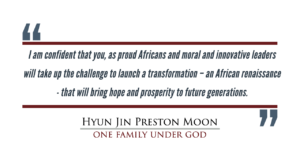 I am confident that you, as proud Africans and moral and innovative leaders will take up the challenge to launch a transformation – an African renaissance – that will bring hope and prosperity to future generations. Thank you and may God bless each of you and your precious families.